I get on the road to go to work and you hear on the radio about “Get out of bankruptcy dot com.” Or another one, “We will save you thousands on what you owe the IRS.” Where do you get the money to pay the lawyers to get you out of debt? Then you have a president that gets caught with his pants down, and the next thing you know his wife is a congressman threatening to run for President. Sounds to me like the lead levels are getting a little too high in the drinking water for that state. The press says the president’s popularity is down to 25%. Sounds horrible, but if you figured only 60 % of people even voted, and he won with about 43% of the vote, that comes out to 25%. I must be missing something here? Ex President Carter spoke up the other day deriding President Bush’s administration as being one of the worst on record. I have yet to find anyone who will admit to having voted for Carter. Everyone still remembers his brother taking a piss on Pee for View. The rather odd thing about President Bush’s administration is that the Democrats want to blame everything on him. It’s kind of like one of those old Paul Bunyan tales in reverse. Or is it our Congress confirming indirectly that they really do nothing up there on the Hill? If they are so good at solving all our problems, then what have they been doing for the last 200 years? When you really examine politics, if two thirds of the Congress could get together and agree on what they want to do, the president could play golf all day or clintonize a secretary or two. So let’s predict the next presidential election (tongue in cheek). I predict that Bill Clinton will be the Republican Nominee for President, with Arnold Schwarzenegger as Vice President. Hillary Clinton will be running on the Democratic ticket with a Vice President candidate that is black, Hispanic, Jewish and gay. Bill Clinton will win the election. Hillary will shoot Bill and President Arnold will pardon Hillary. Talk about a happy ending! Sir Arnold, a Knight from the Kingdom of Kalifornia, will save us! 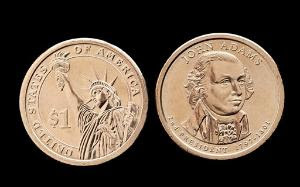 Here are two coins, an old silver dime and the new Presidential dollar coin. Just for a laugh, which one is worth more? Answer, the silver dime is worth about 9 cents more. I am not really picking on all mutual funds just the open ended ones, the closed end ones look OK. The open ended funds are open to anyone and new shares will be issued to the investing buyer. There is a built in flaw with these funds. If the stock market turned bearish and started to drop drastically, things would start to happen. Your mutual fund portfolio would drop in value. At this point you have three choices; withdraw your funds, switch to a non stock portfolio with the fund, or do nothing. With withdrawal, you could face an early withdrawal penalty of 5% or as with the tax deferred accounts, an IRA penalty on top of that. The stock fund manager is sitting in his office wants to buy the market, everything is at a discount. What’s he being ordered to do? Raise cash! So what’s he about to do? Sell into a declining market. I just hope they don't try to sell the whole 23%. There is an exception to this model and it is called a Closed End Mutual Fund. The managers of these funds don’t have to do anything when things get rough. Their fund’s shares trade like stocks. In a panic, you could sell your shares to another investor. It would not be uncommon for a closed end fund to trade for a 20% discount to the book value of the stocks it held in its portfolio. A great little shopping item, if you spot a panic. In this case you are buying a portfolio of stocks that has a fund manager without calls to raise cash to meet withdrawals. The real disconnect that I see in the mutual fund market is the interest in the foreign funds. The Asian markets are touted as a "New Frontier." My jaw can't drop that low, I'm just too old. When Templeton suggested that market, the absurdity of the idea boggled my mind. Don't go there! Where are the VA Foreclosures? I was just dusting off my real estate license and wondering how many VA repos were for sale in San Diego. It's kind of weird, only 3 for the whole state of California. Florida had 20 and Arizona had 1. The nice thing about VA Repos as a real estate agent, you get both sides of the commission. You get the full 6%. Back in 1999 it was normal to see anywhere from 20 to 50 properties listed every two weeks for the San Diego area alone. The big thing about VA Repos, was that they could set the comps for a particular area in a fast way. From the looks of the present figures, there is a couple of years of agony in this market before it even gets to the 1999 figures. The peculiar thing is that Realtytrac has 6,100 houses listed as REO's in the San Diego area. You'd kind of guess that maybe about 50 of them ought to be VA. Here's a neat site for California readers. It lists the REO's, NOT's, and NOD's for an area (you only get 20 in an 8 mile radius unless you want to pay for the service) Foreclosure Radar. My wife went through our whole address book on this web site, and it does not look good anywhere in LA or San Diego (at least for the people we know). Let’s see we have a housing bubble, a credit card bubble, and now I suggest a stock market bubble. Notice that I am not whipping out a bunch of charts to prove my points, just some thinking that suggests that there are discrepancies in the widely held mind set. If you were in the market back in the 1970’s, it didn’t matter what you bought, it didn’t go up or down. It was like watching paint dry. Now the dividend was another story. This was where the money was made. If you go back to the housing bubble there was a similar situation. The cost of ownership became financially impractical when considering the cost of renting the same property. This same problem occurs with stocks. If they go up forever, there is no problem. But if they stop appreciating, then the only thing that sets them apart from an interest bearing bank account is the dividend. Using Big Blue as an example, IBM is at $102 and paying $1.60 per share. Let’s figure over a 10 year period it doesn’t budge in price. In this scenario, the return from a saving’s account would return three times more than the IBM investment. Looking back to 1984, IBM was at 124 and paid $4.20 in dividends. Notice how the logic of the last paragraph falls apart, if stocks take off and go up another gazillion points. Notice also, the mind set of the investors that bought into the real estate market. “Real estate always goes up.” We know where that thinking could lead in the end. The stock market has been going up since 1982 and has not had a 5,10 or 20 year bear market in the interim. Very few people can remember back to when the market was a cruel master. You could argue that the market is fairly priced, (if you figure for inflation) and I would have no argument with that. But, if you consider the lack of reasonable dividends to support the present prices, and the absurd prices for stocks that have no dividend or earnings, you have to realize the market is not functioning on a rational level. The baby boomers are not going to be interested in growth when they retire, only interest and dividends. They will be trying to preserve their principle and live off of the interest. Something is wrong. Everyone seems to be a professional trader. It defies logic, that every household using a discount broker, knows what they are doing. People are placing bets and making money. They must be doing something right. This has no grasp on reality, if you compare it to the investment environment of the 1970’s. The contraction of the money supply has started. Housing foreclosures nation wide are a good indication of that. Marking all of this housing to market, is enough to give the note holders spasms of the lower colon. The housing bubble is obvious, the credit card bubble is a little hidden, and the stock market bubble—who knows. If gas goes to $40 per gallon, then we know that there is no bubble, just your ordinary hyperinflation. That concept is the one I don't want to entertain. Did Gas Prices Go Up? Gas right now is $3.50 a gallon. The price of gold has doubled. This can’t be inflation, because our wages should have doubled also (or so the scenario implies). Lets look a it from a different perspective. Gas and gold have not changed in price. Then what has changed? Could it be the value of the dollar? What are we really viewing here is perspective. Perspective is an interpretation of events. There is no real right answer, either could be right at any point in time. Take two different people one retired and one just entering the workforce. The retired guy on a fixed income just had his buying power slashed in half. The guy entering the work force will not have enough experience to sort out his place in the realm of economics 101 yet. He just got on the ride. Add to this, an economic downturn, and a Congress that can be depended upon to grease the chute to hell, you have the beginning of a real mess. If its deflation, the governments tax base decreases. If its inflation, the landholders ability to pay taxes decreases. Either way the government is locked into decreasing revenue. In the 1930’s government raised the tax rate because of falling tax receipts. This exploded in their face. More, meant less in the end (pun intended). The general public's perception of this “inflation” could become more apparent by necessity. It costs 60 bucks for a tank of gas, that pretty much shoots a 100 dollar bill. What if the Treasury started printing $1,000 bills? Wouldn't that set off warning bells? Kind of like seeing a rat trap in your favorite restaurant. What scares me is the idea of a guy walking around with a $1,000 bill in his wallet thinking that he’s never had this much money before. Here's hoping that its deflation instead. You never know whats going to happen next with this Congress passing bills that have already been pre-vetoed. Is that a mule or a jackass that they have for an icon?